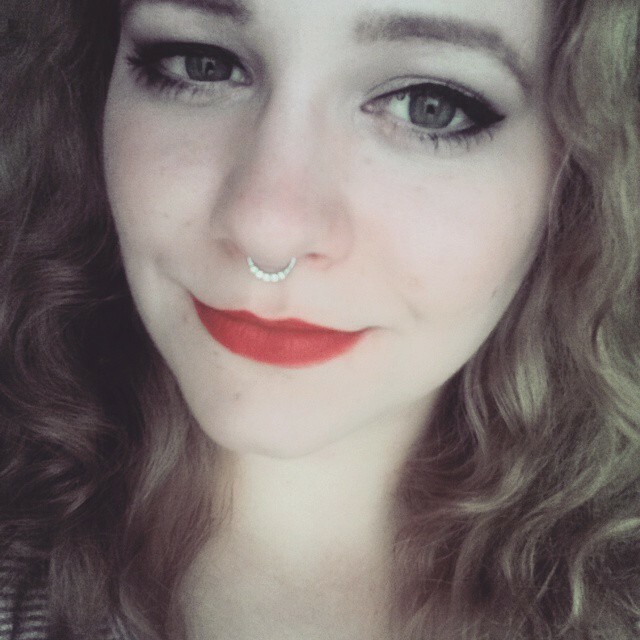 Septum piercing experience! - Cherry Colors - Cosmetics Heaven! 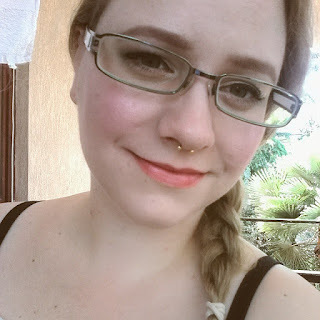 As my readers know, I have loved the idea (and look) of a septum piercing for the last 5 years. 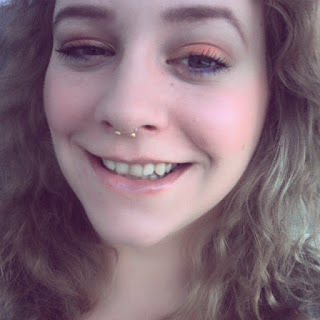 I wrote a quick post back in the day, regarding septum piercings. It was one of the most popular posts on my blog. Back in the day there were no septum clickers, or they were really hard (and expensive) to find. But you know what? I made my long time dream true, a bit more than a month ago. Yes, I had my septum pierced! I went to my trusted piercer, which is the gal I was going to for the last 10 years (Oh, I'm old!). I first checked if she has anything pretty in stock and she said she doesn't really do fresh piercings with clickers (because they need to be healed first), but I then insisted on a retainer. This was all through text. I went there the next day, to talk it through with her and she took her time and explained everything. She checked if I am a candidate for this kind of piercing and luckily, I was! Then I asked if we would do the piercing now or another time and she let me decide (of course :P). I wanted it NOW. We agreed on a clear retainer from bioplast, because my septum is wide. Not the sweet spot, but the lower part (close to the lips?). She cleaned everything, let me try out a clicker (just to see if I liked the look) - faking it, not piercing with it. I did like it, but I wanted the septum to be higher up, because I like the close set rings on a septum. And clickers of course. Some more cleaning and marking and then when everything was nice, she pierced me with a hollow needle. Truth to be told, the piercing pain itself wasn't bad. I mean it was like a soft pinch, but my eyes did water (it's a reflex, and it was nothing to do with the pain). And I don't have a high pain tolerance, mine is pretty high. And I am stubborn! Then some checking went on (move your lose, like this, and this and this). And I could feel the piercing tugging on my lower part of the nose. Whoops! She said we'll fix it right now, because she kind of pushed too low. I didn't mind, because I know that in the end the job she does is always excellent and we're all humans and make mistakes. This meant that I had to be pierced through the same hole, again, just with another exit. OH boy. You know the second time it was more painful, but because my nose was sore at this point. Luckily it was over soon and some clean up followed. I was an owner of a new septum piercing! She flipped it up, since I didn't want anyone to know and five minutes later, off I went. I had my retainer flipped up for the next month. I told my dear about it, but he couldn't see a thing (you know clear retainer, flipped up.. yeah, invisible!). My nose was sore. Very tender and painful to the touch. The pain subsided as weeks passed by. The first week was the worst. Nose was sore, the "feet" of the piercing made me pissed, since it felt weird. And the kid kept hitting me in the nose, while he slept. Nightmare material! I did Sea Salt Soaks 2-3 times a day and after I cleaned all the boogers / crusties with a q-tip. The soaking was annoying, but I found out that the warmer the water, the easier is to bear it. Because soaking your nose in cold SSS is terrible, like having a very stuffed nose. Ew! So, because of all that hitting, my piercing developed one kleoid bump. I wasn't happy about it, but I was hoping it would go away soon. After three weeks, my piercing felt almost perfectly fine. Just the tip of my nose was a bit sore. After a month, I went to check back to my piercer (because I was in town), if my clicker has come. Well it didn't, but we picked another kind of jewelry for the time being - a circular barbell with white opalite balls. Really pretty! I am not a fan of circular barbells, but this one looked fine! Her assistant went and cleaned my nose and took the task of changing my piercing. The retainer went out easily, (tho the bump was kind of annoying). But the new piercing didn't want to get in. It was too small!! Also my piercing wasn't healed - and that gave them some trouble. Whoops! That's when we realized I need an at least 10mm long bar. Oh boy. After 15 minutes of trying and almost giving up, she took a big (as in 1.6) circular barbell and some golden balls. On it went and everything was fine. I am not a huge fan of gold balls, but they look pretty, alright. So, I had this thing now in and I wasn't really that comfortable showing it off to the whole world. I was a bit embarrassed to say the least. It took me a week to be completely comfortable with it around people. The first day my nose was sore again. It took 3 days for it to get back to normal, or actually even better than normal. After one week my piercing felt healed! It's an amazing feeling. No matter what you do with it, you can't feel it. :D So I think I like the healing with a circular barbell more. But the thing with a moving barbell is that these crusties form. I mean they form anyway, no matter the jewelry, but with a circular barbell I could feel them. When I was on the seaside they formed like 30 minutes after cleaning. Oh. And if the piercing moves, they get in the piercing hole and BOY THAT HURS! It's like glass shreds digging in a fresh wound. Oh. Damn. After one week (when my piercing felt fine) I decided to try and get the balls a bit more further apart (so open the piercing more), so I could flip it up. I tried using my clean hands, gloves, pliers, nothing moved it for more than a 1mm (in the end). Off to the bathroom I went, where I first tried to put on some different balls and after about 30 minutes of trying (and them falling like everywhere!) I realized that they are too small! So I wanted to use my gold balls, and after a couple of seconds, one was on. And then I lost the second one. DAMN! That's when I decided to f*ck it, and put the piercing out (because it somehow got really damaged and a metallic thread came around the threading, oh!) and use my old trusted retainer. The retainer went in without a single problem. BUT, the pressure it applied with its feet is annoying. When I had it flipped in, I got a toothache. Seriously! And when it's outside, I got a headache. I chosethe headache instead of toothache and went to sleep. I was pissed, because the pain/discomfort made me irritated. This is when I realized I need a bigger retainer. I mean the part that goes in the piercing is fine, but the feet are too close together and my nose is obviously big.